Welcome to the Small Town Transformations blog! This is where we’ll share ideas to provoke your thinking about how art can transform your town. We want you to be inspired by these communities, whose innovative arts practice lies at the heart of their towns. We’ll let you know when we post new examples – sign up to our mailing list for updates. We start with an excellent provocation from Jo Grant, one of Regional Arts Victoria’s Creative Arts Facilitators – asking What’s your story? Jo gets straight to the heart of how you might start to develop your thinking for the big ideas in your application. 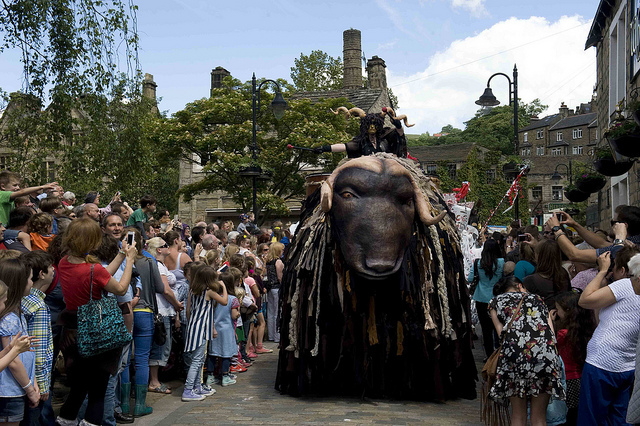 Next I have chosen a fantastic tale from very close to where I grew up in the UK – The Handmade Parade in Hebden Bridge. I hope you enjoy reading their story and seeing their extraordinary work! Finally, our Small Town Transformations book is available to read online – enjoy reading about the first five town projects. To visit their individual projects visit the 2012-14 Projects page. Small towns: What's your story? Since the announcement that Small Town Transformations funding is returning for regional Victorian towns in 2016, our communities are buzzing with focused conversations and preparing to come together to think about how art might transform their towns. How can you come up with something really special? Perhaps the key to finding that something special is to know your story. Each town has a story, a unique thing that only belongs to you. It might be historic, funny, environmental, geological or quirky. But you have one. The best way to find that story is to map your town. Get together and write down all its features, the groups, the people, the places you like to be. Map your stories (the tall and truthful), your green spaces, the places that people feel connected to. Write it all down. Consider how your town is perceived by others and be honest. Think about what’s old and new, what has worked and what hasn’t. Put it altogether and observe any themes rising to the top. There will inevitably be something that defines the story of your town, something you’re proud to name and then you’ll have it, the basis for your thinking. Your story. Use this story as a guide, a touchstone for every conversation you have about your town in the context of transformative projects and you’ll be one step further towards finding that special idea that will change your town. Candy Chang project, Looking for Love again. Hebden Bridge is a town with an idea that grew from a small community program into an annual event that has been emulated across the UK, and now the world. It’s an example of how a town’s idea engaged a diverse community, built skills, and embraced new and shared local histories. The Hebden Bridge Handmade Parade (website) began in 2008 and has grown into one of the largest community events in the world. It is an annual 'celebration of funkiness' delivered by a maker of giant puppets in collaboration with a local theatre company. More than 1000 people now participate each year, with thousands more looking on. The partnership between the puppeteers and producers has grown into a business venture based in Hebden Bridge that produces large-scale, participatory outdoor arts events across the UK and the world. The open-access nature of the parade celebrates their town and their place in the region and builds the creative skills of the community, drawing local and international guest artists to run open workshops in design and craft skills used to make costumes and floats. The Handmade Parade has put Hebden Bridge on the map as a cultural destination and centre of excellence, and has inspired a yearly program of spin-off events such as the Lamplighter Festival, as well as similar events across the world like Wellington's Handmade Festival. Our document of the first Small Town Transformations program is available to view online. Read about the transformations in Avoca, Dookie, Neerim South, Ouyen and Natimuk, the processes they undertook and the outcomes for their town and surrounds. You can also view short documentary videos about each town within their listing on this website. Click here to visit the project pages.